4.1 Humans transfer and transform energy from the environment into forms useful for human endeavors. The primary sources of energy in the environment include fuels like coal, oil, natural gas, uranium, and biomass. All primary source fuels except biomass are non- renewable. Primary sources also include renewable sources such as sunlight, wind, moving water, and geothermal energy. 4.3 Fossil and biofuels are organic matter that contain energy captured from sunlight. The energy in fossil fuels such as oil, natural gas, and coal comes from energy that producers such as plants, algae, and cyanobacteria captured from sunlight long ago. The energy in biofuels such as food, wood, and ethanol comes from energy that producers captured from sunlight very recently. Energy stored in these fuels is released during chemical reactions, such as combustion and respiration, which also release carbon dioxide into the atmosphere. 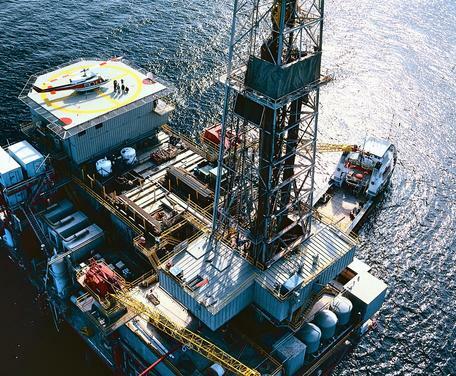 As oil resources become more scare, exploration pushes the boundaries of what is technologically possible, such as drilling in deep offshore waters. Provenance: Photo from Microsoft image galleries. An energy transition is underway. The landmark 2016 Paris Climate Accord sent a clear signal that a worldwide move toward low-carbon energy is imperative. Even though the US intends to pull out of the Paris agreement, the switch to clean energy continues unabated, led by other nations worldwide, as well as by US states, cities, and corporations. The origins of our energy supply is an exciting and engaging topic for students and is an excellent way to learn about different ways that energy can be generated, as well as the impacts and societal implications of various types of energy. These concepts revolve around energy that is used for human purposes, including renewable and nonrenewable sources of energy, storage of energy, generation of electricity, and transportation of energy from place to place. As essential starting place for this topic is the concept of renewable vs. non-renewable energy sources. Many students will already be familiar with the idea that fossil fuels regenerate at a rate far slower than we use them, which is why they are non-renewable. Renewable energy comes in many forms: hydroelectric, solar, wind, geothermal, and biofuels. Each of those offers a host of related topics and nuances. For example, solar energy can be generated on a single rooftop or in large, utility-scale solar farms. Solar energy can also be generated in concentrating solar power plants that use an array of mirrors to direct the Sun's energy to a central tower. This type of solar power can deliver energy even at night. A detailed study of energy generation can prevent an overly simplistic labeling of particular types of energy as good or bad. It's also worthwhile to address the practical and technological aspects of energy. The distribution of energy resources across the globe is uneven, as some regions have an abundance of energy sources while others do not. The areas where energy is used most intensively are not necessarily the same places where energy resources naturally exist. For example, rich oil and gas deposits are found in offshore marine environments and wind farms are located in rural settings. In both cases this energy is transported to a location where the energy is consumed. Moreover, the end uses of energy vary with geography, time of year, and time of day. Thus energy needs to be transported, stored and converted from one form to another so that it is available when and where it is needed. Just as ecosystems depend on the input of energy, human societies are also dependent on energy for infrastructure, transportation, food, and most other types of human activities. However, there are limits of how much energy is available to a given society. Even renewable forms of energy are dependent on geographic location and technological accessibility. Nonrenewable energy supplies are finite and create impacts from their extraction, transportation, and consumption. Energy pricing, energy equity, and energy security are all factors that dictate how readily energy is available to different parts of society. Some societies have an abundance of energy while others struggle to have their basic needs met. By learning about these concepts students can begin to see how humans are dependent on using energy but are also constrained by the practicalities of energy use. Energy Information Administration graphic that shows the breakdown of energy use by different sources. Most students already understand that energy can originate from many sources. However, they may hold misconceptions about where their own energy comes from or how much energy is derived from various sources. For example, students may be surprised to learn that only a small fraction of the US energy supply comes from wind turbines and other renewable sources (10% in 2017), while 81% is from fossil fuels. Nuclear power creates 9% of the US energy supply (Energy Information Administration, 2017). Despite the popularity and importance of renewable energy technologies, it's important to understand that fossil fuels still make up the great majority of our energy supply, and it is forecast to remain that way for the coming decades (source: Energy Information Administration, 2017). This illustrates the extraordinary challenges we face in moving beyond fossil energy. Transitioning away from fossil fuels brings about a new set of questions such as energy storage, battery technology, and an energy supply that is knit together from numerous intermittent sources rather than a few, steady-state power plants. Today's students are likely to be enthusiastic about renewable energy, which is a great way to get them engaged. But it's important that they learn about the challenges and realities of overhauling the energy system. For example, consider the vast installations of renewable energy it will take to replace the 81% of the energy supply that comes from fossil fuels, and the logistics of where to locate wind turbines, solar farms, or other new energy infrastructure. Numbers are important. A quantitative treatment of these subjects makes it clear that we have a long way to go in securing a dependable, safe, and clean energy supply. 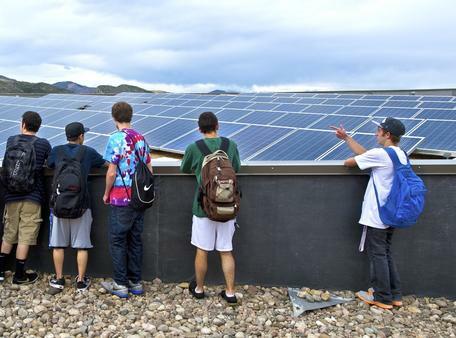 Students look at a photovoltaic solar array on the roof of the high school during a renewable energy lab. The National Renewable Energy Laboratory sponsors the "Solar in Schools" program that has been adopted by Jefferson County School in Colorado. Photo by Dennis Schroeder / NREL. More than many topics we teach, our energy future is a problem with no certain answer. This can be an exciting call to action for students. Perhaps they will be part of designing solutions? The Next Generation Science Standards emphasize engineering, design, interdisciplinary thinking, and problem solving. These ways of thinking are essential for tackling this challenge. Energy is part of every student's life and is used all around us. Therefore it is easy to find relevance in teaching about energy sources. The activity Power Source, asks teams of students to create a concept sketch of electricity that begins at their own light switch and trace it back as far as they can go. This activity can be used with any grade level and it serves as an introductory activity that can prompt further exploration and can also reveal misconceptions. Students can take this concept further and design their own energy portfolios based on internet research about various energy sources. Students could also examine cutting-edge energy innovations such as solar roof shingles, energy from algae, or novel ways to store energy. Nearly every day we learn of a new possibility. The flip side of this is that it can be hard for educators to keep pace with the rapid changes. For example, renewable energy prices are falling every year, and renewable energy installations are outpacing projections all around the world. Educators need to be mindful to present up to date information, which may involve checking and updating figures every year. The Energy Information Administration offers an abundance of data, maps, graphs and forecasts that can be used to investigate a number of questions. Energy for You shows students how to explore the types of energy resources in their home state. Algal Biofuels: An Emerging Renewable Energy - students explore the basic living requirements of algae (phytoplankton) through hands-on experience and an interactive game. Oceans of Energy focuses on ocean exploration as a way to learn how to capture, control, and distribute renewable ocean energy resources. Students research one ocean energy source using the internet, then build a micro-hydro electric generator. The Great Energy Debate allows student teams to develop key points on the pros and cons of their assigned energy source and compare it to others. The United States of Energy is an engaging, interactive map and database that illustrate energy production and consumption in different states. Useful for student-driven internet research, or comparing energy in different states. Wind Maps is a map of the mean annual wind speed 80 meters above the ground. This map can be used to evaluate the potential for wind energy in the US. Wind Energy Using Google Earth uses seven large wind farms scattered over the globe to compare the potential wind resource capacity of each farm. Our Energy System is an interactive diagram from the National Academy of Sciences that shows how we rely on a variety of primary energy sources to supply energy to four end-use sectors (residential, commercial, industrial, and transportation). Electricity data browser contains up-to-date data on electricity generation in the US. Data can be filtered and graphed in multiple ways and is useful for inquiry-driven lessons about energy generation. Natural Gas and the Marcellus Shale uses a case study approach to learning about hydraulic fracturing. Selecting Sites for Renewable Energy Projects uses Google Earth to investigate a variety of renewable energy sources and to select sites within the United States that would be appropriate for renewable energy development. Different Regions of the Country Use Different Fuel Mixes to Generate Electricity (pdf) - This map, arranged by census region, illustrates the diversity of fuel use and shows how the electricity generation mixes in various regions of the country differ. U.S. energy production, consumption has changed significantly since 1908 - Article from the U.S. Energy Information Administration, showing the changing energy mix from 1908 to 2016. Electricity sources by region can be found in a 2016 map, a 2015 interactive map, or the EPA Power Profiler. eGRID - This EPA database is a comprehensive source of data on the environmental characteristics of almost all electric power generated in the United States. These environmental characteristics include air emissions for nitrogen oxides, sulfur dioxide, carbon dioxide, methane, and nitrous oxide; emissions rates; net generation; resource mix; and many other attributes. Renewable Energy - This website contains summaries of various forms of renewable energy and is presented in a format that is readily readable by high school students.